We believe we can change the world through Sustainable Hostelling. 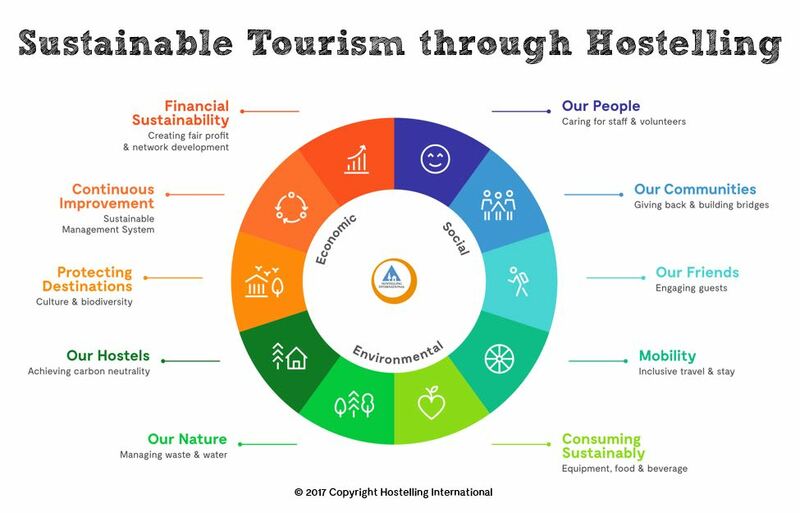 Hostelling International is dedicated to promoting sustainable tourism practices among our National Hostelling Associations and with Hostels themselves. We are committed to achieving a worldwide network of sustainable organisations and hostels. With more than 100 years of experience we strive continually to improve and expand our network to new places, meanwhile working with governments and voluntary agencies to create the same positive practices and high standards everywhere. Hostelling International (HI) and its member associations commit to intensifying their efforts to achieve a worldwide network of sustainable organisations and hostels. 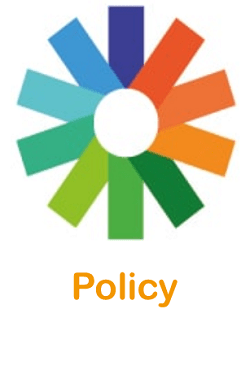 The HI Sustainability Charter - Our Policy in Sustainable Tourism has been adopted by our General Assembly in 2010 by HI and each member association. It is based on the Global Sustainable Tourism Council (GSTC) criteria, an organisation dedicated to promoting sustainable tourism practices around the world. We are working together to foster increased understanding of sustainable tourism practices. "GSTC commends Hostelling International for adopting sustainable policies and practices. HI shows its commitment to the full breadth of sustainability and responsible travel issues by striving to adhere to their standards which are GSTC-Recognized for their compliance to the GSTC Criteria, the global standard for sustainable travel and tourism." Through these 10 areas, we aim to expose in detail how youth hostelling drives sustainable tourism to foster development globally - have a look at our local initiatives to see how HI Hostels walk the talk around the world. The UN Sustainable Development Goals (SDGs) - the global goals aiming to eradicate worldwide issues by the year 2030 - are a crucial part of our focus and each of our programmes and projects highlight their contribution towards the SDGs. HI is part of the UN World Tourism Organisation (UNWTO) Board of Affiliate Members and leaders of UNWTO Sustainable Development Goals Working Group and we are strongly committed to engage all our members in contributing to the 2030 Global Agenda. You are at the centre of everything we do. While your budget may be limited, the quality of our hostels is not! We aim to provide you with the most enjoyable stay possible, while offering excellent value for money. Therefore, we have developed a way of ensuring quality and sustainability in our hostels, firstly through our internationally agreed upon HI Standards, and secondly through HI’s Quality & Sustainability Management System: HI-Q&S. HI-Q&S is a long-term programme of continuous improvement that allows hostels and associations to advance their quality and sustainability practices. Implementing HI-Q&S increases the hostels’ transparency and accountability of why and how they are sustainable. Why is this so important? Because it helps deliver the HI Mission, it assures operational efficiency, risk management and customer satisfaction while helping you make informed decisions and be part of a global community of responsible travellers. The HI Quality & Sustainability Management System is recognised by the Global Sustainable Tourism Council. 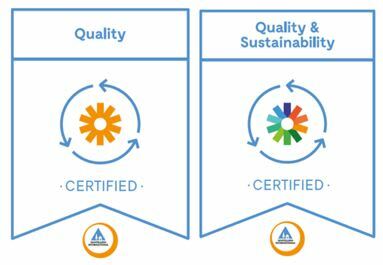 It includes the HI-Quality (HI-Q) step and those hostels who implement the sustainability criteria are awareded HI-Quality & Sustainability (HI-Q&S). HI-Q&S is used in 41 Associations and nearly 500 Hostels worldwide. Read the HI-Q&S criteria and see the full list of HI-Q&S Contracted Hostels. Check out some of the sustainability related labels that can be found in the HI Hostels. The Austrian Ecolabel stands for higher living standards and environmental quality, clear and transparent information, highly informative environmental policy in ownership of companies and organisations, and high-level co-operation with excellent facilities. Their partnership of environmental agencies and utilities assists, offers incentives, and verifies that participating businesses conserve energy and water, minimise waste, prevent pollution, and shrink their carbon footprints. Businesses that meet their standards are officially recognised as Bay Area Green Businesses. ‘Certified Emissions Measurement and Reduction Scheme’, otherwise known as CEMARS, is the first two steps of the ‘carboNZero’ programme, which enables businesses and organisations to measure their greenhouse gas (GHG) emissions, understand their carbon liabilities and put in place management plans to reduce emissions in their organisation and through their supply chain. Climate Action Business is awarded to businesses that have undertaken a set of adaption and emissions reduction actions but are not necessarily measuring their carbon footprint. It goes without saying that a bicycle is the most sustainable and environmental way of getting around and exploring your destination. In Denmark it is no different and with more than 10,000 km of cycle routes it is the perfect way to see all that Denmark has to offer. Hostels that display the ‘Cycling Denmark’ logo have been approved by The Danish Tourist Board as a cycle-friendly accommodation. The ECO Certification logo is a globally recognized brand which assists travellers to choose and experience genuine and authentic accommodation that is environmentally, socially and economically sustainable. The ECO Certification program assures travellers that certified products are backed by a strong, well managed commitment to sustainable practices and provides high quality nature-based tourism experiences. 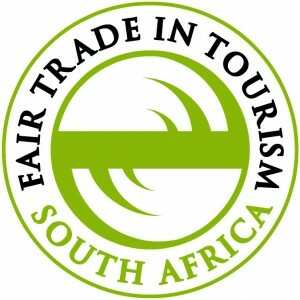 Fair Trade in Tourism South Africa (FTTSA) encourages and publicises fair and responsible business practice by South African tourism establishments. They do this by offering a certification programme (and supporting activities) that endorses tourism establishments that meet stringent criteria, fair wages and working conditions, fair operations, purchasing and distribution of benefits, ethical business practice and respect for human rights, culture and the environment. Fairtrade is a strategy for poverty alleviation and sustainable development. Its purpose is to create opportunities for producers and workers who have been economically disadvantaged or marginalised by the conventional trading system. Fairtrade is a tool for development that ensures disadvantaged farmers and workers in developing countries get a better deal through the use of the international FAIRTRADE Mark. GodAdGang is a Danish quality label that provides information to users about accessibility. The Accessibility Label is granted in one or more of seven disability categories. Service providers who have been granted an Accessibility Label meet the minimum accessibility requirements in one or more of the seven categories. To make it easier for travellers to go for a greener choice, some of the hostels In Iceland are specially labelled as a Green Hostel. These dedicated hostels have all shown their commitment to nature in the running of their hostels. All HI Iceland hostels must fulfil General Quality Standards, and to be able to use the Green Hostel logo the hostels also have to fulfil additional environmental criteria. It is important to note that this is not a recognised environmental certification but standards that HI Iceland decides and supervises, with the professional support of a consulting agency which audits the hostels. Green Key Global is an environmental certification body whose suite of industry standard programmes and resources has been designed specifically for the lodging and meetings industries. Our programmes help members leverage organisational CSR activities to support sustainable initiatives, improve overall fiscal performance and community relations. ‘Green Tourism Business Scheme’, otherwise known as GTBS, is the national sustainable tourism certification scheme for the UK. Originally developed in partnership with Visit Scotland, it is now the only certification scheme validated by Visit Britain, through the International Centre for Responsible Tourism (ICRT). Businesses opting to join Green Tourism are assessed by a qualified grading advisor against a rigorous set of criteria, covering a range of areas, like energy and water efficiency, waste management, biodiversity and more. Those businesses that meet the required standard, receive a Bronze, Silver or Gold award based on their level of achievement. HI’s Quality & Sustainability Management System that shows the hostel’s commitment to supporting its community, preserving the environment and offering memorable experiences. The HI-Q&S standards are recognised by the Global Sustainable Tourism Council (GSTC). Read more. The leading Swiss label for sustainability, ibex fairstay (formerly Steinbock-Label), stands for personally and independently tested quality in the fields of management, economic efficiency, ecology, social awareness, as well as for regional and cultural engagement, and in this way for sustainable experiences during your vacation. ISO 14000 is a series of international standards for environmental management. 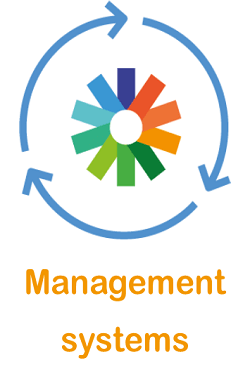 It provides a framework for the development of an environmental management system and the supporting audit programme. The KRAV-label is the most well-known symbol in Sweden for organically produced food. The KRAV-label on a food product shows that it has been produced in an environmentally-friendly and ethical way. MINERGIE® is a sustainability brand for new and refurbished buildings. It is mutually supported by the Swiss Confederation, the Swiss Cantons along with Trade and Industry and is registered in Switzerland and around the world. myclimate is amongst the world leaders when it comes to voluntary carbon offsetting measures. Science-based and market-oriented, myclimate offers a comprehensive package of services for offsetting in accordance with the principles of "avoid – reduce – offset" and "do the best and offset the rest". ‘Qualmark New Zealand Limited’ is New Zealand tourism's official quality agency. It licenses professional and trustworthy tourism businesses in New Zealand to use the Qualmark 'tourism's official quality mark' to help international and domestic travellers select places to stay, things to do and ways to get around. All businesses carrying the Qualmark logo are assessed on their environmental performance in terms of energy efficiency, waste management, water conservation, community activities and conservation initiatives. The City of Santa Monica, the Convention and Visitors Bureau, the Chamber of Commerce and Sustainable Works have joined together to certify and recognize green businesses in our community. Sustainable Travel International offers the Sustainable Tourism Education Program (STEP) which is seen as the gold standard in the travel and tourism industry. The STEP Eco-Certification Standard is formally recognized by the Global Sustainable Tourism Council, the internal body for sustainable tourism accreditation. 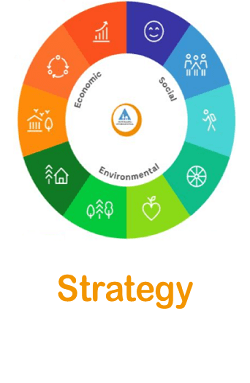 STEP provides an educational foundation and practical framework for implementing a holistic sustainability management system appropriate for the size, scale, and scope of business operations related to travel and tourism. All STEP certified businesses have successfully completed a rigorous process which involves completing a self-assessment, developing a sustainability policy, and conducting triple bottom line impact assessments. Evidence is subject to verification of a specific set of criteria as determined by the businesses operations. At a minimum, 20 sustainability best practices have been verified by a second or third party and an independent evaluation committee has confirmed the findings and awarded eco-certification. The Green Key® is a worldwide eco-label awarded to leisure organisations. To obtain The Green Key, a business has to fulfil a list of environmental requirements based on a number of set criteria. ‘Nature’s Best’ certifies ethical, high quality nature tours in Sweden. It was the first national quality label for ecotourism in the northern hemisphere designed to offer the traveller an unforgettable nature experience. It combines responsible nature conservation with more environmentally friendly ways of travelling that care for cultural heritage, local community and the environment. The Swan is a world-leading Ecolabel with stringent environmental and climate criteria for 65 product groups. With more than 900 Swedish companies that market more than 6,500 Nordic Ecolabelled products, the Nordic Ecolabel is in a class by itself. The purpose was to provide consumers with a tool (our Nordic Ecolabel logo) to help them choose among the best, from an environmental standpoint, products on the market. Criteria is developed by using a life-cycle analysis. That means that we judge the environmental effects a product has from several aspects: energy and water usage, kinds of chemicals used, recycling and reuse of waste products. Viabono certifies accommodation in Germany. The German HI Hostels that are Viabono certified fulfil strict requirements including high standards for customer value and environment compatibility, which ensures a high quality of "natural travel and enjoyment". The list of criteria includes the conservation of resources in terms of waste, energy, water and climate as well as the protection of nature and the countryside.